Perth Old Appliance Removal & Disposal | 1800-GOT-JUNK? Ready to upgrade your appliances but not sure what to do with your old models? We've got a team and a truck for that. At 1-800-GOT-JUNK?, we have the equipment and manpower you need to pickup and dispose of your outdated appliances quickly and easily, so you can spend less time worrying about getting that dryer up the stairs and more time enjoying the benefits of your new one. You've made the decision to have your old appliance(s) removed. What happens now? When you call 1-800-GOT-JUNK?, you'll get to talk to a real live person who can help you set up an appointment for us to come out. If phone calls aren't your thing, that's fine too. You can schedule your appointment directly through our website from your computer or even a mobile device. We'll give you a narrow two-hour window for your pickup, but we know that sometimes it's hard to be sure you'll be home. That's why we also have our team give you a courtesy call 15-30 minutes before they'll be at your house. Once the team arrives, you can show them the item you need taken away, and they'll let you know how much it will cost to remove. You can be assured that we don't give quotes or estimates. Our prices are all-inclusive so you know exactly how much you'll be spending. If the number we give sounds good to you, our team will take the appliance right then and there and make sure to leave the area looking as good as it did when they arrived. If you've ever tried moving a refrigerator or washer on your own, you already know that appliances — especially older models — are notoriously heavy. Getting an old appliance out of the house is often a two-person-plus-dolly job. Add in having to go up or down a set of stairs (even a small one), and it can be downright dangerous. 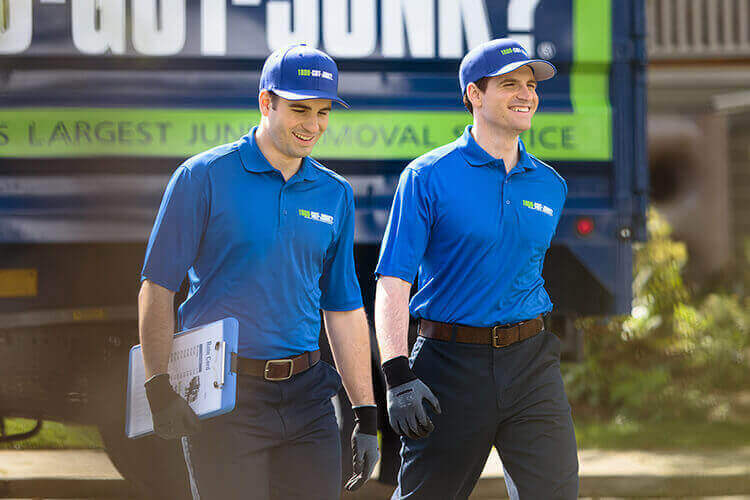 At 1-800-GOT-JUNK?, we know that you're time is important to you, and that's why we come out to your house to quickly and safely dispose of your old appliances without you even needing to lift a finger in the process (except to call us). Perth old appliance removal and disposal is also a great choice for businesses and individuals who are environmentally conscious. Once we've picked up your appliance, it's taken to a facility where any hazardous materials or chemicals are removed. Then, the recyclable components are properly disposed of where they can be reused in other applications. Recycling old appliances is an easy way ensure hazardous chemicals and ozone-depleting substances — commonly found in insulating materials and refrigerants — don't continue to release fumes in a landfill or dump. It also lets you feel good about reducing your overall carbon footprint and making a difference in the health of our planet. Getting rid of outdated appliances shouldn't have to be a chore. Call us today at 1-800-GOT-JUNK? and let us do all the heavy lifting.